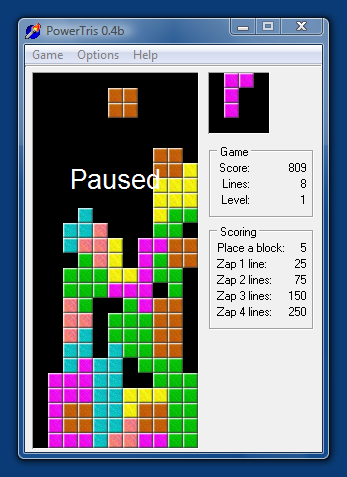 PowerTris is my newest version of the popular Tetris game. It looks better than my old DOS version and has sound effects, but the rest is pretty much the same. 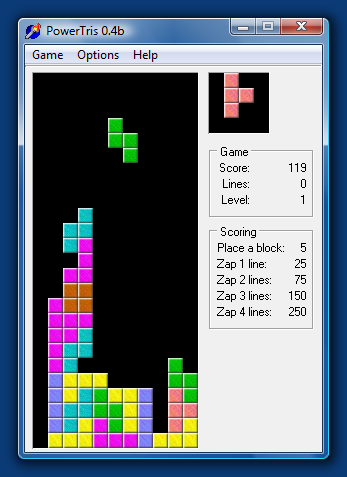 Yeah, as if you really don't know Tetris. Classic game: Singleplayer with increasing difficulty. No special stuff. Three different tile sizes, optimized for 640 x 480, 800 x 600, and 1024 x 768. Two sets of sound effects. Settings, like rotation, next tile on/off, smooth scrolling, auto-pause, etc. This starts a new game in classic mode. If you're already playing a game you'll be asked to confirm. This pauses or resumes the game. This will end the game and still allow you to enter the high score list. This opens the high score dialog. This opens the settings dialog. Here you can switch between three different graphics sizes. Small is recommended for 640 x 480, Medium for 800 x 600, and Large for 1024 x 768 or above. This enables or disables sound effects. This opens the credits dialog. Fixed: You can now quit the game while paused. Fixed: "Game Over" and "Pause" are now centered in all resolutions. Changed: The blocks look a little better now. Enhanced: Blocks can now rotate close to the edges. Added: Bonus for clearing the playfield (25,000 x Level). Added: Sound effects when rotating and dropping blocks, completing a level, and clearing the playfield. Added: Sound effect themes. The default sounds are no longer compiled into PowerTris.exe. Setting: Clockwise or clounter-clockwise rotation. Setting: Auto-pause when switching focus. Setting: Smooth movement when clearing lines. Setting: Small, Medium, or Large blocks (wasn't in Settings). Setting: Enable or disable sound effects (wasn't in Settings). Setting: Enable or disable individual sound effects. Setting: Pause music when the game is paused. Changed: All settings are now saved in PowerTris.ini. Fixed: You can now quit the game while playing. Fixed: When clearing lines the top line is now removed properly. Changed: The blocks now look a little different. Instead of having one surface they are now built out of smaller blocks. This was done for multiple reasons. 1) It's easier to see exactly how big a block is. 2) The edges are no longer fuzzy when blocks have been partly removed. 3) By programmatically building the blocks the graphics were reduced from 336 KB to 1 KB. 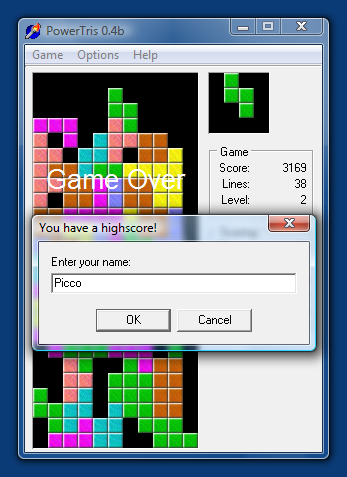 Implemented: The game now shows Game Over instead of just quitting the game. Implemented: Pause. 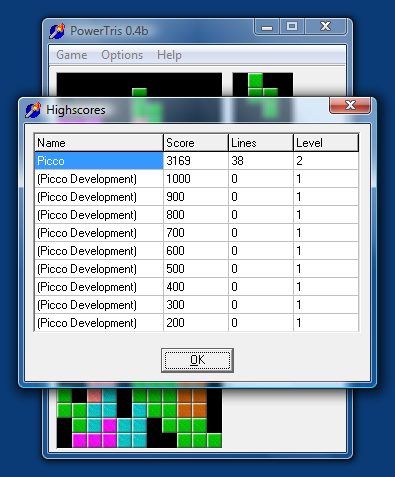 This can be toggled using Game|Pause from the menu or by hitting P.
Implemented: Block size. You can now switch between small, medium, and large blocks, even while playing. Partially implemented: Preferences dialog with user-defined controls. Partially implemented: Some of the settings are now saved in PowerTris.ini. Added: Bonus for dropping blocks. This awards Height x Level extra points. Added: F1 is now a shortcut to Game|New. Removed: Ugly picture of me.